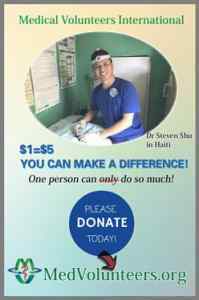 In 2014, Dr.Steven Shu joined the “No-Scalpel Vasectomy International, Inc”, an international medical volunteer organization led by Dr. Doug Stein. Dr.Shu made a total of four trips to the Philippines and Haiti in the past two years. With the power of social media and social networking, overseas Chinese physicians should be able to set up an organization, such as MVI, to connect with people around the world to help those in need of medical aid. Through communicating with other Chinese physicians, Dr.Shu learned that many physicians share similar interests and goals, and are willing to be involved in medical volunteering, but most of them do not know how or where to start. He also learned that some physicians in North America are already at the forefront of such endeavors, the most prominent being Dr. Jun Xu. Dr. Xu has visited Senegalese, Africa for medical mission trips every year since 2013, and Dr. Junkui Zhang and Dr. Tiebo Fu have participated in medical volunteer activities in Central America. Therefore, at the end of 2016, after careful and thorough consideration, Dr.Shu decided that the time for advocating overseas Chinese physicians to establish an international medical volunteer platform has come. After discussion with Dr. Jun Xu and other physicians who showed great enthusiasm and support, a council of nine members was formed. On January 29, 2017, MVI was established and started to recruit new members immediately. In the meantime, fund-raising efforts have begun. MVI was incorporated on February 8, 2017. By April 30, 2017, a total of 99 people joined the MVI with 64 official physician members. IRS approved the MVI’s 501 C3 tax exempt status in the March, 2017.